Dynamic (fluctuating) volume when there are 2 or more active sound sources. Description: When playing a game and listening to music at the same time, the volume for either of the applications will fluctuate, for example the music volume will lower down when there is a high noise coming from the game (like explosions). I haven’t found any fix for this except the workaround that’s presented below. Set Windows Volume to 80%-90%. I noticed that this issue is only present when Windows volume(or panel volume) is above 80-90%. So my recommendation is to not exceed this limit. Workaround here is slightly different from the one in WinXP, you’ll have to set the volume in each application at 80% or below. You can set Windows Volume to 100%. Please note that moving the mixer playback sliders in ASUS Audio Center above “76” or moving digital volume sliders in C-Media Control Panel above “0” dB will cause the same issues. Until further notice, all driver versions (UNi or Asus) have this problem. This page is only for discussing the problems and solutions described above. For general help, comment on the main UNi Xonar page. Just installed the driver but I dont see the software to play around with the sound. Where can I get to the sound mixer ? I am using W7. Hi. Have you installed drivers with Low DPC Latency configuration? Look for “Asus Audio Center” or “C-Media Audio Panel” in Start->Programs->UNi Xonar Audio. BTW this is not the place for help. In the future use this page. Hi, I don’t see how can make new question, so peak that here. I make my own player for self. And there I have volume controls for 6 channels. And that work fine on realtek sound card. For Sonar D1, I don’t get the speakers via call devicetoplogy and enumerate parts. I see you can manage levels for front, rear, center..
Me interest have you, or are somewhere some dll wrap for cmdevice.dll or something like xonarswitch or for something that can do that ? Hi. You’ve posted in the wrong page. A suitable place would have been the main UNi Xonar page. I don’t have an answer to your question. Please webmaster, delete or edit my previous two comments. Today I put on an audio CD beginning with vocal only with bass guitar gradually appearing and forcing the female voice to go down into the background instead of the initial foreground position. The only way to fix this is that mentioned in the original post, by setting the Mixer volume sufficiently low (thus losing much needed volume if using the computer for playback in your Hi-Fi system). With mixer on default value the same track plays flawlessly, with no artificial compression. Apologies for my premature comment. You can update this guide for Windows Vista/7/8/10 workaround fix. 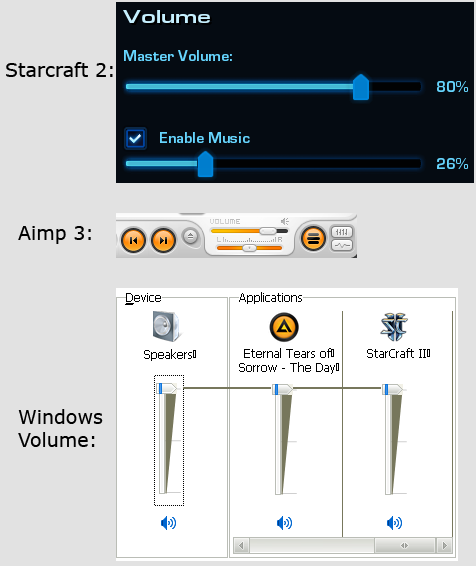 Setting the Master Volume in the Asus Audio Center is the same as setting Windows Volume. When I tested setting Windows Volume to 80% on Windows 7 it didn’t seem to have a significant effect as opposed to setting 80 volume per each application. I may take another look at this. I’m not sure what are you want to suggesting with Left and Right playback channels in Asus Audio Center. By default these are set at 76. I mean, if I set windows volume to max but left/ right channels below 80 its fixing for me fluctuating. Or when left/right channels are set to max, windows volume needs to be less than 50% and that also fixing fluctuating. Theres no need to set every app volume less than 80% in my case. 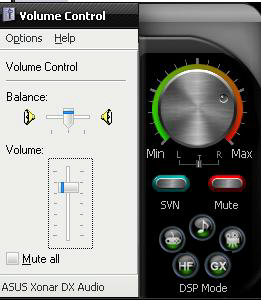 But channels volume and Windows Volume are different. I’ve retested this on Windows 7 and setting Windows Volume to 80% does not fix or reduce the issue as opposed to setting 80 volume per each application. On which OS did you test? FYI Left and Right playback channels in Asus Audio Center shouldn’t be raised above default(76) because they will have sound quality, at least this is happening when Windows Volume is also set to 100. In Asus Audio Center, after I calibrate my 5.1 speaker volume (playing around with the sliders), after I click Main button then switch back to Mixer it slowly increases all the channel volumes back to 76. The appropriate page for your problem would be UNi Xonar main page. Please repost your comment there.